Solution #2 (proprietary): Buy access switches that can download VLAN information from vCenter (example: Arista with VM Tracer). Solution #3 (proprietary/future standard): Use Cisco UCS system with VN-Tag (precursor to 802.1Qbh). UCS manager downloads VLAN information from vCenter and applies it to dynamic virtual ports connected to vNICs. 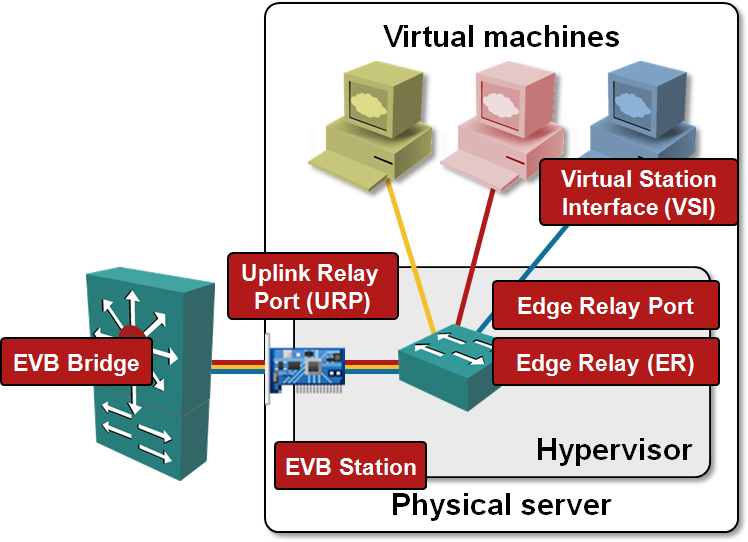 The emerging Edge Virtual Bridging (EVB; 802.1Qbg) standard addresses numerous networking-related challenges introduced by server virtualization. Today we’ll focus on EVB’s easiest component: VM provisioning and Virtual Station Interface (VSI) Discovery and Configuration Protocol (VDP). One of the most interesting parts of EVB is the VSI Discovery and Configuration Protocol (VDP). 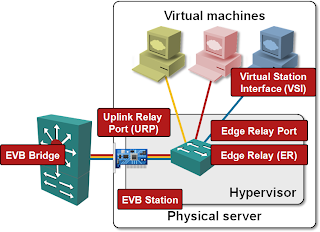 Using VDP, the EVB station (host) can inform the adjacent EVB Bridge (access switch) before a VM is deployed (started or moved). The host can also tell the switch which VLAN the VM needs and which MAC address (or set of MAC addresses) the VM uses. Blasting through the VLAN limits (4K VLANs allowed by 802.1Q), the VDP supports 4-byte long Group ID, which can be mapped dynamically into different access VLANs on as-needed basis (this is a recent addendum to 802.1Qbg and probably allows nice interworking with I-SID field in PBB/SPB). Pre-associate phase, where the hypervisor host informs the access switch about its future needs. A hypervisor could use the pre-associate phase to book resources (VLANs) on the switch before a VM is dropped into its lap and reject VM migration if the adjacent switch has no resources. Associate phase, when the host activates the association between VSI instance (virtual NIC) and a bridge port. Obviously there’s also the De-associate message that is used to tell the EVB bridge that the resource used by the VM are no longer needed (it was moved to another host, disconnected from vSwitch/ER or shut down). Numerous vendors have “embraced” EVB and “expressed support”, but as far as I know, Force10 is the only one that has announced EVB support in an actual shipping product. VMware doesn’t seem to be interested ... and why should they be? However, most of the EVB functionality (at least the ER part and station-side VDP implementation) has to reside in the hypervisor/vSwitch. Open vSwitch seems to be doing a bit better; at least they’re discussing the implications of VEPA. You’ll learn more about modern data center architectures in my Data Center 3.0 for Networking Engineers webinar (buy a recording). The details of VMware networking (including the limitations of vSwitch mentioned above) are described in VMware Networking Deep Dive webinar (register here). Both webinars are also part of the yearly subscription package. Great article, Ivan. I'd encourage you to add "Solution #4 (shipping/future): VN-Tag/802.1Qbh". Summary is that VM-FEX is a shipping product that directly addresses the "Challenge" at the beginning of the article. Since 802.1Qbh is based on Cisco's FEX technology and is moving along towards ratification very nicely, I think adding this 4th solution to your article would be useful to the reader. Added the VN-Tag/802.1Qbh as one of the solutions. Thank you! Great post. I hadn't even heard of this. FYI - Avaya Virtual Services Platform 7000 has support - though I cannot find if this is shipping yet. I'm a bit surprised you got to nearly the end before you even mentioned VEPA. I think all of these techniques potentially could collapse under the weight of their own complexity. Also, from a somewhat narrow networking perspective it all makes great sense, but from a broader perspective (i.e. server, storage, apps) it leaves a lot to be desired. IMHO, as virtualization densities grow, the hairpin traffic problem is going to undermine all of these efforts. Sorry Avaya Virtual Services Platform 7000 was only announced on the 4th of May - would not be shipping as yet. While EVB does make some sense (assuming the virtualization vendors won't see the light and implement proper L3 solution), VEPA is a total kludge. More about that "wonderful" technology in an upcoming post. Looks like Extreme is offering some support. How do you define the difference between EVB and VEPA? It's always been my understanding that EVB = the general term for everything VEPA, Port Extension, and other related technologies. VEPA is part of EVB standard. VEPA = ER that cannot perform local switching but sends all VM frames to EVB bridge. Hi Ivan, do you know if this situation has changed and VMware vDS now supports VDP? If not, what vSwitches support VDP in the market? I know HP 5900v and IBM 5000v are supposed to. Does OVS? Nexus 1000v? Thanks! No major changes. The only switch supporting VDP seems to be IBM 5000v. As for what HP's vSwitch does, let's wait till it ships. Everything looks great in a glossy PDF. Thanks for the reply Ivan! I see 802.1Qbh was withdrawn, replaced by 802.1BR? What is state of the world now? Lost all interest & stopped tracking it at least a year ago.